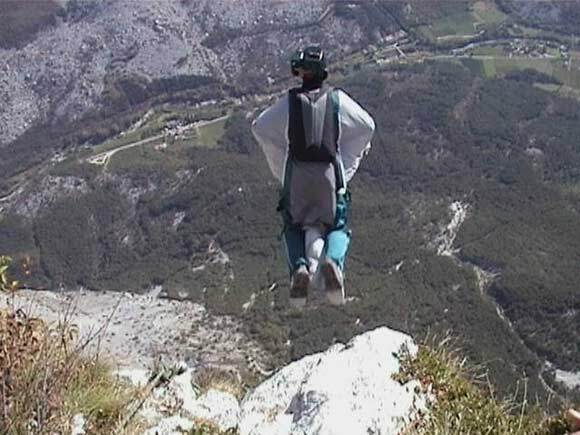 "This was quite a conservative jump, but that's because it was the first of it's kind for me and changes (such as wearing the restrivtive wingsuit) must be made slowly to stay safe. I spent approximately 25 seconds in freefall (the record here by an experienced jumper, in fact the guy who made the suit I was wearing, has freefallen for a minute), dropping 1700 feet, deploying at 2200 feet above the landing area (this is conservative as it is similar to a skydiving altitude deployment, whereas in BASE there are no rules and openings can be as low as a few hundred feet - if you have the balls/experience).Pulling higher is sometimes necessary in order to make designated landing areas depending on wind conditions. By my calculations, I moved away from the cliff face by about 0.4 of a mile!" Dates: 07/10/2002 10:56:30 -10:56:54 the wingsuit flight; 10:56:55-11:00:05 the canopy ride to the landing area. 07/10/2002 10:56:55 - 11:00:05 The canopy ride to the landing area.